A beautiful day on the green! Fifteen players from Berkeley faced fifteen players from Palo Alto. The clubs were tied after the morning game (2 wins each, plus a tie), but Berkeley prevailed in the afternoon, and once again, the Meat Axe trophy will be displayed on the our wall. Congratulations to the crowd below; every team won at least one game. Special thanks to Shawn, directing his first inter-club event, who was totally organized and ran a great show! But at least as important, many members helped make the day particularly successful. During the days preceding the event, the ditches were weeded, the grass and surrounding paths were swept, the gate was cleared, and the weeds were mowed. On Saturday, particularly nice snacks were laid out, flowers were the vases, coffee was made, and bowlers were there to greet our guests. At the end, a thorough cleanup happened as if by magic due to the many hands who participated. I’m not attempting to name all names because so many helped, even some members who did not bowl, and I don’t want to miss anyone. BLBC can be proud of putting on a fine event! 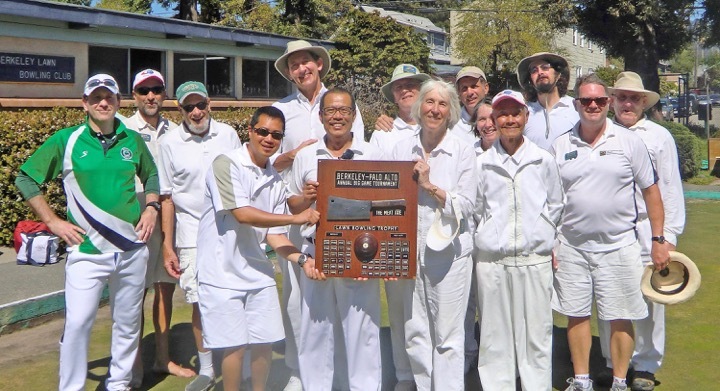 We promote the game of lawn bowling for the enjoyment of new and experienced players alike. Let the (2019) Games Begin!